First I'd like to emphasise that this is a blog post on how and not why. The why comes down to the judges. So, thanks Judges! Secondly I'd like to thank Rob Dunfey for the idea and for providing additional motivation - I'll dig deeper into this later. Finally: what am I going to cover? As the title suggests, I want to cover the how. I've been friends with Rob Dunfey ever since I worked at ESRI back in 2005. When I worked there my job title became "GIS Consultant" but if I'm honest I was really only ever a Web Developer (that's not a bad thing). Since then we've worked on a couple of projects together - Rob now works as a Geo-Information Consultant at Shell and I'm a "Developer Evangelist" at Pusher. I'm following my passion for Realtime Web Technologies and web development, and Rob is following his passion for GIS. However, we do infrequently work on projects together and, to be honest, it's sometimes quite difficult to get Rob to slow down with his ideas about using GIS to solve real problems. One of the things he also sees is the opportunity to use web technologies to solve those problems. Frequently we encounter a business problem that requires a solution enabling multiple colleagues capture information on a map at the same time, in a dynamic fashion. One such use case may be a workshop event, where you want to capture locations favoured by attendees - you could try that at the Palm Springs dev summit, if you ask attendees to mark up a map with their home location, all done real time, allowing the conversation to develop around the map edits - real time. If you've seen the README for my Realtime Collaborative Mapping entry you'll notice that the introductory paragraph is almost identical to this. The ability to collaboratively edit a map in realtime had clearly been identified as something that people really want - and need - to do: A problem that needed to be solved. To succeed at something it's important to be motivated. I'd like to think that in this case the motivation behind the Realtime Collaborative Mapping application really helped ensure that the result was successful. If you combine my knowledge of realtime web technologies with Rob's knowledge of GIS then the most obvious use case is a realtime collaborative mapping application. So, we've been discussing this idea for quite some time. This competition was the perfect platform to get Rob off my back prove that the idea we've been bouncing around for months could be achieved. 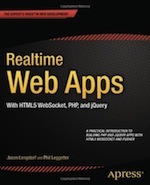 Finally, I've been working with realtime web technologies for over 10 years now and I saw this as a great opportunity to demonstrate the power of realtime web technologies. And to demonstrate that using realtime web technologies is really easy. The role of a developer has changed quite a bit since I graduated with a Software Engineering degree in 2001. Up until I joined Pusher my role was primarily a Software Engineer attempting to follow what the industry defined as "best practice"; first documentation through to development (the waterfall model), then an increased focus on testing, which continued with the introduction of agile in the form of Extreme Programming (XP), SCRUM, Kanban etc. The reason that things changed when I joined Pusher wasn't because the development team don't follow those best practices (or their own incarnation of them) - they do. It's because I started to attend hackathons where the focus is creating something functional - ideally with a wow factor - within a short space of time. The teams that tend to win such events aren't necessarily the best software engineers, but are those that have a developer toolbox that they can look through when they are trying to solve a problem. Application runtimes and frameworks: for web development where you probably (see point 4) need a web server and a database this is important. Your developer toolbox should contain these already setup up and ready to go. Or provide ways of quickly doing so. A knowledge of APIs and hosted services: By knowing what APIs and hosted services are available you can quickly uses these tools to achieve things that would otherwise take you hours to weeks to achieve. Hosted services - which offer APIs - actually combine productivity tools, application runtimes & frameworks and the functionality offered by 3rd party libraries. This makes them amazingly powerful and, I'd argue, are becoming the most important tools in a developer toolbox. Firebase for realtime synchronisation of data (graphics) between users. a landing page where users could enter an existing webmap ID, or choose from some pre-selected ones. The type of drawing that the user had selected in the toolbar view. My use of Firebase goes to show just how easy it is to add realtime functionality to web applications using a realtime web hosted service. I used Firebase to persist and share the graphics data between all users who were viewing the same map. I used Firebase as a model for the graphics on my map. What this meant is whenever a new graphic was added I simply added it to Firebase and the added code was called. The really clever bit is that the code was not only called within the app of the user who added the graphic but also within the app for all other users who were view the same map. When a user clicked the Clear All button I prompted the user for confirmation and then removed the webmap node from Firebase. In a real app I'd use Firebase security to restrict who was allowed to execute such a function. I've supplied quite a bit of detail here. But this all actually only equates to the code using the Firebase object 5 times. Wow! 5 lines of code to convert a web application into a realtime collaborative web app - realtime web technology really is powerful! The power of realtime web technologies - with 5 lines of code I've made an application support multiple simultaneous users and collaborative. This means that anybody in the world with a web browser and an Internet connection can collaborate on a map with anybody else. How using a hosted service + API to add amazing functionality in fraction of the time and effort it would take to write this all myself. The importance of a having a well equipped Developer Toolbox - I hope this has got you thinking about what's in your Developer Toolbox. I'm sure the ESRI DevSummit has given you more tools to add to your toolbox arsenal, and it's important that you continue to improve what's in there by attending events, reading up on technology and trying things yourself (maybe at hackdays). I also need to look into how I'm going to get to Palm Springs for the ESRI International Developer Summit in 2014. Maybe I could propose a talk about how I built the Realtime Collaborative Mapping application and get some costs covered? Hopefully I'll see you at the ESRI Developer Summit in 2014!